Recently, I was contacted by a member looking for some information to help one of his retired police officers who may be experiencing some post-traumatic stress from events experienced when he was an active officer. This officer’s family was concerned and asking for some help. In researching resources to help, I reached out to a number of different people I believe would be able to give some insight and learned of the Milwaukee Area Police Officer Support Team. 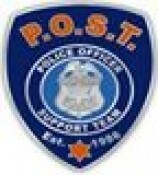 The Mission Statement of the Police Officer Support Team (POST) is to provide members of the law enforcement community, who may be suffering from emotional, personal, physical, or stress related difficulties, access to high quality support services so as to have an opportunity to work at resolving any difficulties they may be experiencing. POST works with a carefully vetted network of mental health professionals in southeastern Wisconsin to provide clinical intervention when appropriate. The Police Officer Support Team exists to provide a voluntary and confidential outlet for officers, employees, and their families, who have a need to talk about conflicts of feelings they may have concerning their job, their home situations, or both. The Police Officer Support Team was established by Milwaukee Police Officers in 1986 after the death of two MPD officers killed in the line of duty, and it serves ALL members of the Law Enforcement Community, officers returning from or in active Military duty, and their families, regardless of jurisdiction or department. I contacted the great people involved with this organization and they were very supportive of the WCPA doing this article to give greater exposure to the team. It can’t be stressed enough that the team is available to any officer, anywhere in Wisconsin. This is such a tremendous resource, especially in today’s challenging world of being a law enforcement officer. Please take the time to review all the great information on their website. They have many links to general resources and specialized police or military related resources, as well as articles of the month and training opportunities. Dr. Craig Childs, Jim Palmer (WPPA), Chief Styka (Menasha PD), and Matthew Jasinski (Milwaukee POST).